Business travelers and other people on the fly will like Google's upgrade to the mobile version of its news site if they don't mind the omnipresent search engine knowing where they are. The company on Friday added new functionality that gives users of the mobile version of its Google News site the ability to view news stories based on their current location. The feature is available on iPhone and Android devices. The catch? Users will need to visit the site and approve of their mobile browser sharing location data with Google. After setting up the feature, local headlines would appear in a section called "News Near Me" at the bottom of the page. If you rather see local headlines before national and world news, you can change the tab order by visiting the personalization settings page. "News Near Me" is an extension of functionality that had been enabled on Google News' desktop site three years ago. You can set up the local news feature there by entering your ZIP code, though the site already attempts to grab statewide headlines for visitors using their computer's IP address. Users can turn off the feature by either hiding the section in personalization settings or adjusting the settings for your browser. Deleting cookies will also have the same effect. But remember that if you do that your settings across all websites will disappear. 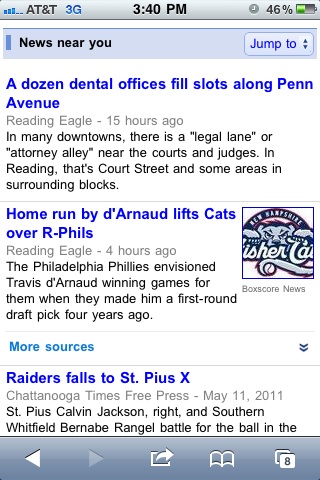 It does a good job pulling relevant local headlines, but there appear to be some bugs. For example, my local paper here in Reading, Pennsylvania, is the Reading Eagle, and both stories that appeared on the front page came from that paper. But for some reason a story from the Chattanooga Times Free Press appeared among the sources. That paper is located in Tennessee. I also had issues initially getting the "News Near Me" section to show up. After accepting to share my location the first time, the section failed to appear. I had to clear my cache and cookies and try a second time to get it to work properly. Still, this new feature has a lot of positives. An argument can be made that mobile sites are prime candidates for location-based services, especially when it comes to news, weather and the like. Of course, there will always be those who raise concerns over privacy issues. You can't make everyone happy.